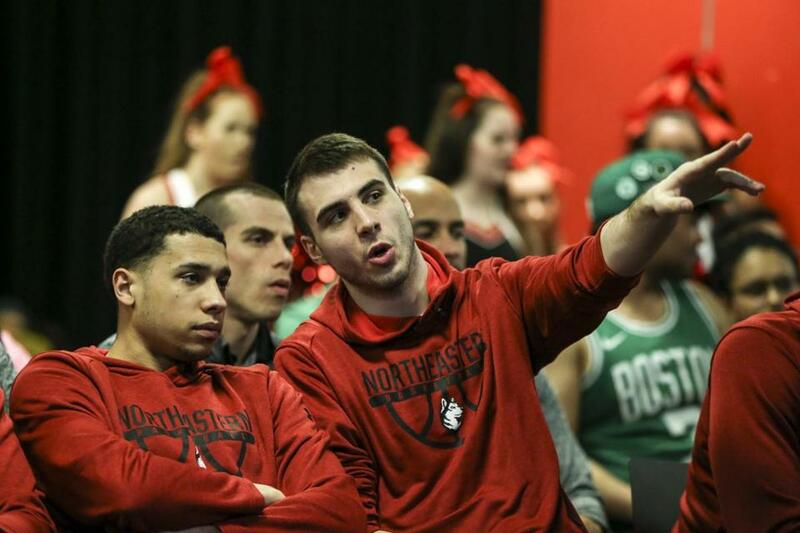 Northeastern guard Vasa Pusica (right) points to the TV during an NCAA Tournament Selection Sunday watch party at Northeastern. “That’s when I kind of decided that I wanted to do something big, that I wanted to make it,” Pusica said in an interview with the Globe on Selection Sunday. Before Bryant, however, there was another influential figure that helped spark Pusica’s interest in the sport: retired NBA forward Peja Stojakovic. Stojakovic — who was selected 14th overall, one spot behind Bryant, in the 1996 draft — was a key member of the Yugoslavian national team that brought home the 2002 FIBA World Championship. The title infused locals, including Pusica, with a fervent love for basketball. From there, Pusica went on to discover Bryant and other pros, as he used them as motivation to work on his game in Serbia. He even wore No. 8 in honor of Stojakovic. Though Pusica had great success in his high school career — he was a member of the Serbian junior national team and also won a gold medal in the 2013 U-10 league with the Partizan Belgrade youth team — he soon realized moving to the United States would better his chances of playing at the collegiate level. “If he was good enough to be deemed a national Serbian player, that’s a pretty good indication that’s a good player,” Givony said. Once at Northeastern, Pusica said he thought he would be a “perfect fit” for coach Bill Coen’s offense. As he did during his final year of high school, however, he continued to miss his parents and two younger siblings often — so much so that he initially considered returning to Serbia. FaceTime and relationships with teammates have helped relieve some of his homesickness. Pusica’s career was pushed back for a redshirt year because of NCAA transfer rules, which was another mental challenge, but he ultimately believes the time off helped shape him into a better player. After officially joining the team last season, Pusica wasted no time in making significant contributions. As a junior, he was the team’s leading scorer with 17.9 points per game and started in all 33 games. The Huskies bungled their chance at the NCAA Tournament that year, blowing a 17-point, second-half lead against Charleston in the Colonial Athletic Association championship. The defeat makes this year’s berth sweeter, according to Pusica. “He’s always been an outstanding player, and now he’s taking more and more ownership for the team’s success,” Coen said. Pusica, a business marketing major, is only taking one course at Northeastern this semester, giving him ample time to focus on basketball. While he also enjoys video games, especially FIFA, he said he spends nearly all of his time playing, watching, or studying basketball.